Now, as you begin to work with other people's code, you may run into a situation where they're using an array type structure for a variable, but it's a different type of variable called an object. This happens in Drupal a lot, so even though many of the same array functions will apply to an object, the way we reference and create an object is going to be different than how we create and reference an array. So in this video what we're going to do is look at how to use an object as an array. Let's go ahead and jump to the resource pack directory, and let's open up the 12th step in the strings and variables folder called using objects like arrays. Go ahead and copy the code and paste it over the code that's in your test dot php file and save it. 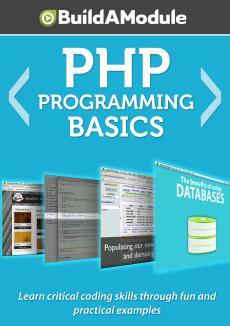 Now, in PHP when you hear the word "object," it has a number of connotations to it. For example, you may have heard of something called object-oriented programming. That involves a particular structure of code that we'll explore much later on in this series, and objects in object-oriented programming tend to be a bit more complex than the ones that we're talking about now even though the structure is very similar. The objects that we're using now are basically an alternative syntax for arrays. They're a little bit more clumsy to create, but many people prefer the object structure when referencing arrays which is why when you use Drupal there's so many arrays that use the object structure, for example, the user variable or the node variable. So what we're doing in this file is looking at how to create an object that's the equivalent to an associative array, and then we look at how to create an object that's the equivalent to a multi-dimensional array. Our first step is to create the object and we do that by assigning a variable, the result of new stdClass. Now, what this will do is simply create an empty object. It's as if we're doing my_object equals array and then we're using empty parentheses in order to create an empty array. The next step is to add items to this object, and we do so by using this dash right bracket syntax.